You ever have that moment when you find your presumptions so upended that you just want to crawl into a corner somewhere and assume the fetal position? That’s a bit extreme, but it’s not far off from my relationship to the work of James Proimos. About five minutes prior to writing this review, if you had asked me to name his children’s books I would have said something along the lines of, “Oh! He just did Patricia Von Pleasantsquirrel and then Paulie Pastrami Achieves World Peace, right?” Wrong. Wrongdy wrongdy wrong wrong wronggers. James Proimos is a man of range. A man with style. A man who has been illustrating children’s books AT LEAST since 2001 when I was a mere slip of a girl, and he has not stopped since. His latest, Todd’s TV is perhaps my favorite of the batch. It sort of takes the notion of parental controls on television viewing to the logical extreme. I think we may have just found our first book for the holiday now known as TV Turn Off Week. I think we’ve also found an author/illustrator who’s going to become a household name real soon. Todd loves his TV. What kid doesn’t? And Todd’s parents love the TV too. Anytime they’re busy with work or the phone or the day-to-day business of life, they can just turn on the old telly and Todd is taken care of. But one day, when both parents are too busy to take Todd to a parent/teacher conference, the television opts to take Todd instead. At first, the parents are elated. The TV drives Todd to school, goes on vacations with him, even tucks him into bed at night Yet when they hear the television confessing to Todd that it’s going to try to adopt him legally, that’s when the folks realize that sometimes you can have too much of a good thing. Fortunately, for every TV, there is a plug. Now if they could only figure out what to do about Todd’s new computer . . . I work in a fairly large children’s room and one day, while cleaning some file somewhere, I stumbled across an old Walt Kelly pamphlet from the 1950s. In it, various characters from Kelly’s Pogo comic strip showed the downside of constant television watching. It was a clever little piece, eschewing the mindless didacticism of most “TV is evil!” publications out there. 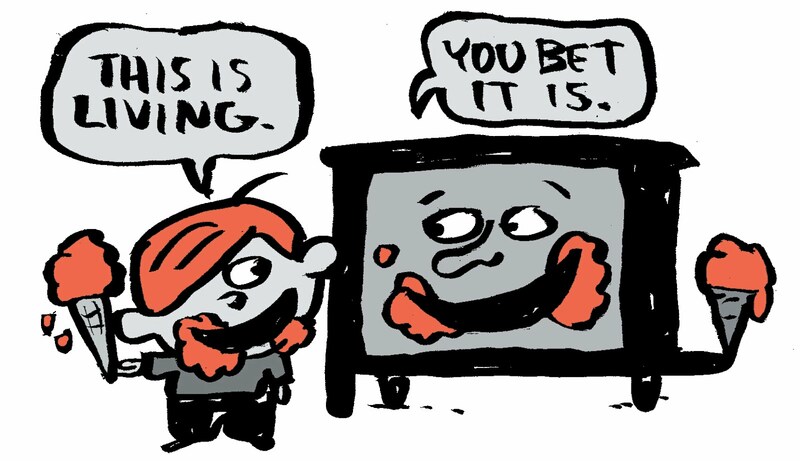 Todd’s TV appears to be the natural successor to that old Pogo piece too. For all that it promotes the idea of unplugging one’s television rather than allow it to raise your children, Proimos is a master of tone. In fact, he’s a genius at it. The story is light and humorous and jovial. There isn’t an ounce of finger wagging or loud obnoxious tsking. You get the point without the author feeling inclined to hammer it into your skull. Amusingly, the TV isn’t that bad a substitute parent. In fact, this television is able to be as good a parent, or better, than the ones in Todd’s life. Yet it’s clear that when all is said and done, kids prefer their real parents to electronic substitutes. That’s probably the real moral behind this story. If you absolutely have to have a moral, that is. Proimos has been compared to James Marshall in terms of his simple storylines and even simpler artistic style. I’d say that, at least with books like Todd’s TV (as opposed to, say, Johnny Mutton) Proimos reminds me more of a Meghan McCarthy without her thick paints. Speaking of paints, boy is this title an interesting limited palette of colors. You’ve got your black, your white, your gray, and then that single bright hue that crops up in the book. You can see it in the title and in Todd’s hair. I’m hard pressed to give it a name. It seems to straddle both orange and red equally. Most interesting is the fact that Proimos has chosen to use this odd in-between color to fill in his speech balloons. Comfortable with the graphic format, Proimos makes his cartoonish speech its own color with black words inside. In the picture book world I cannot think of an equivalent to this. Normally when an illustrator works in black and white with just a spot of color, the color always ends up highlighting the most important element in any given scene. Proimos seemingly upsets this balance because the television, with only a few minor exceptions, is always illustrated in black and white. The color instead belongs to Todd’s father’s socks or the soft inner ears of a juggled rhino. And cute as those are, they’re not the point of one scene or another. That’s when I decided that the key to the book was the colored speech bubbles. If the whole point of this story is to turn off your TV once in a while, maybe you could go a little further and point out that the thing Proimos is highlighting over and over again in this book isn’t the technology, but the words upon the page. It’s the words that are colorful and important. Nothing, to my mind, could be clearer. Now, the only way Todd’s TV works is if the television in question is old-fashioned. I suppose Proimos could have made the television a flat screen, 3-D, plasma doodad, but aside from the fact that such TVs date within seconds, how would it get around? This television is the kind that’s set into a thick wooden frame. It has legs and a screen the size of a goalie net. And thanks to those legs it’s able to walk around a bit, drive a car, and do a bit of surfing on the side. It’s certainly the most dated element of the book (the laptop at the end appears to be quite new and Mom wears a pretty cool pair of contemporary pants with cowboy boots) but that’s not a problem. Kid’ll just go with the flow. All in all, this is a great introduction to the world of Proimos. I know that other folks are huge Paulie Pastrami fans, but gimme a sentient cable box over a deliciously named protagonist any day of the week. And while certainly his most recent books have been getting a little more attention, Proimos is a man with a sturdy children’s literature background. This is a good thing. It means that when you fall in love with his books, just as I have fallen in love with Todd’s TV you’re going to have a whole backlist of his titles to discover and read and enjoy. Hail to the Proimos! And hail to future books of his.